And On The Sixth Day …. It’s never ceases to amaze just how stupid some politicians are. Not does it never cease to amaze when the consequences of their actions backfires. 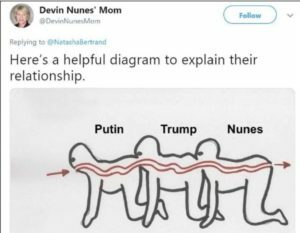 Prime example would be Republican California Representative Devin Nunes, he of the midnight run to the White House to prove “no collusion,” who filed $250 million lawsuit against Twitter, specifically a Republican strategist, and two parody Twitter accounts, one purporting to be Nunes’s mother, the other purporting to be Nunes’s cow. While the parody account of his mother has been suspended, @DevinCow now has over half a million followers, more than the congressman. The Stars Hollow Gazette is 527,150. 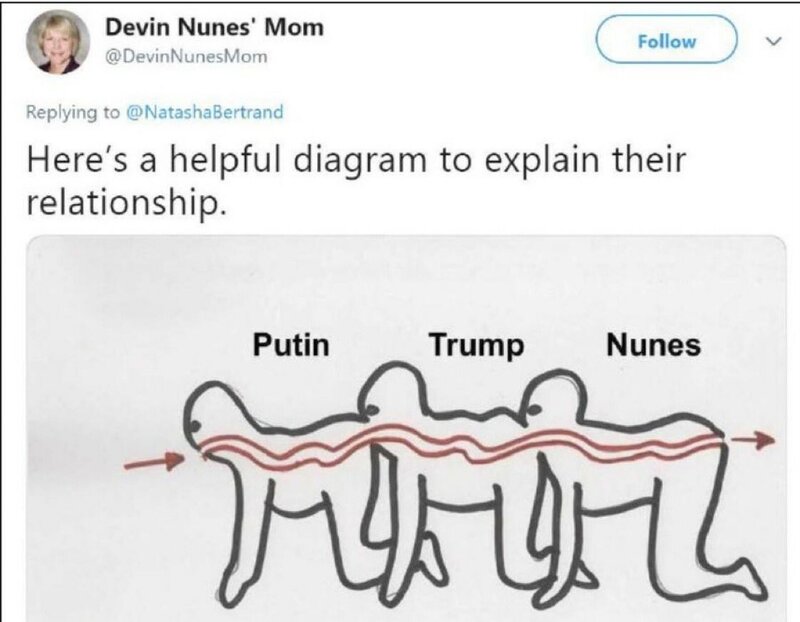 The creator of @NunesMom worked around the suspension creating a new account Devin Nunes’ Alt-Mom @NuneAlt, re-posting a screenshot of an deleted tweet that had a “helpful diagram” to explain Nunes’ relationship with Trump and Russian President Vladimir Putin. That family reunion should be fun. Pundits are calling the lawsuit “bonkers” and “ridiculous” particularly given Nunes’s co-sponsorship of a bill called the Discouraging Frivolous Lawsuits Act. Last night Seth Meyers, host of NBC’s “Late Night.” took a closer look at Nunes’ lawsuit. One other point that Nunes seems to have missed, courts have ruled that under the First Amendment public figures can be parodied and ridiculed. Here’s hoping a judge will dismiss this frivolous lawsuit and teach Nunes a lesson by making him pay for everyone’s court costs.